lifespan (in hours): note that a bulb is used on average for 1,000 hours per year (about three hours per day). Initially, the energy label was introduced by the European Union to classify household electrical appliances. Today it is used in more and more fields: electric light bulbs, television sets, buildings (EPB certificate) , cars, etc. The aim is to enable you to give preference to appliances that use less energy and that will cost less during their lifespan. View this image in large. The most visible information, because of its large lettering and the grading of the colours, is the energy class of the bulb. The best bulbs are those in class A, the least good in class G. In other words: A-class bulbs are the most efficient because they use less energy than the others to supply the same amount of light. Compact fluorescent light bulbs are in category A or B.
Incandescent bulbs are in category E or F.
in watts (W), the electrical power absorbed (3). This gives an indication of consumption: the more powerful a bulb, the more electricity it uses. For instance, a 13 W light bulb will use 0.013 kWh (kilowatt hours) every hour. in seconds (sec. ), the start time (7): this is the time it takes the bulb to reach 60 % of its light output. the capacity of the bulb to work with a dimmer switch (9). 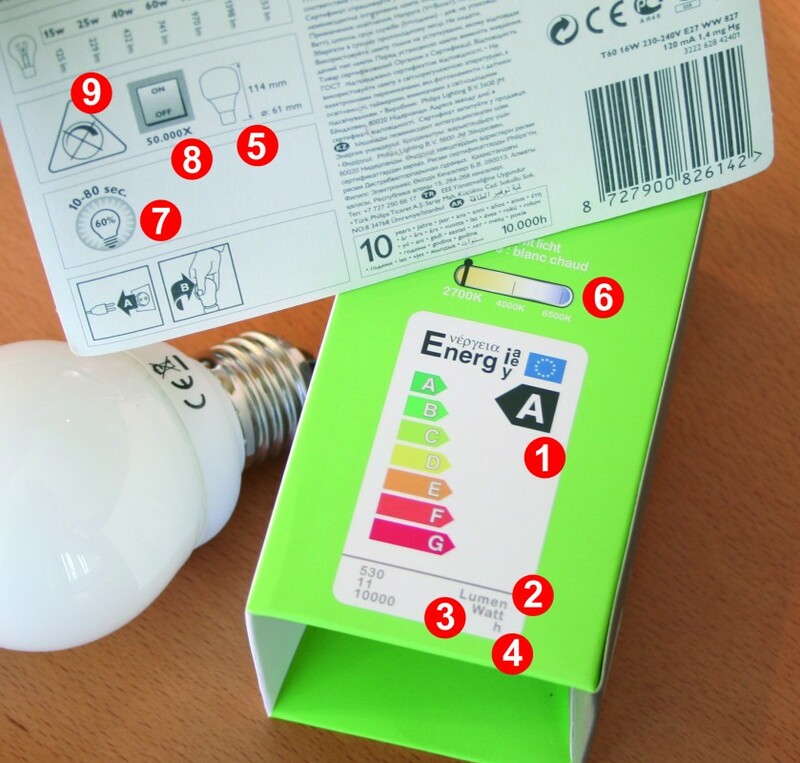 While the energy label tells you about the energy performance of the light bulb you have bought, it does not say anything about its impact on the environment. You will find out a little more by checking whether the bulb carries an ecolabel (a blue and green flower with star-shaped petals). This European label guarantees products that have less of an impact on the environment and which are safe and reliable to use. N.B. : This labelling is voluntary, which means that the product fulfils the ecological criteria set but is not necessarily the most environmentally friendly on the market (other products that do not carry the label may be equally or even more environmentally friendly).